Oh the creative juices are flowing! After I made my first batch of Kataifi baskets I could not stop thinking about the possibilities of this new (for me) ingredient. I felt a bit like a kid with her first package of Play-Doh. Myriad ideas of fantastic dishes, both savoury and sweet, kept popping into my head. I had to hit the Greek Deli and buy more of my new favourite pastry! I love the texture of Kataifi. Each bite has that satisfying crunch. For this recipe I filled the tart shells with a soft, chewy macaroon filling, scented with lemon zest. It is a luxurious complement to the crack of the tart shell as you bite into it. Drizzling them with a bit of melted chocolate adds another layer of flavour and texture and will transport you to another level of ecstasy, I promise! 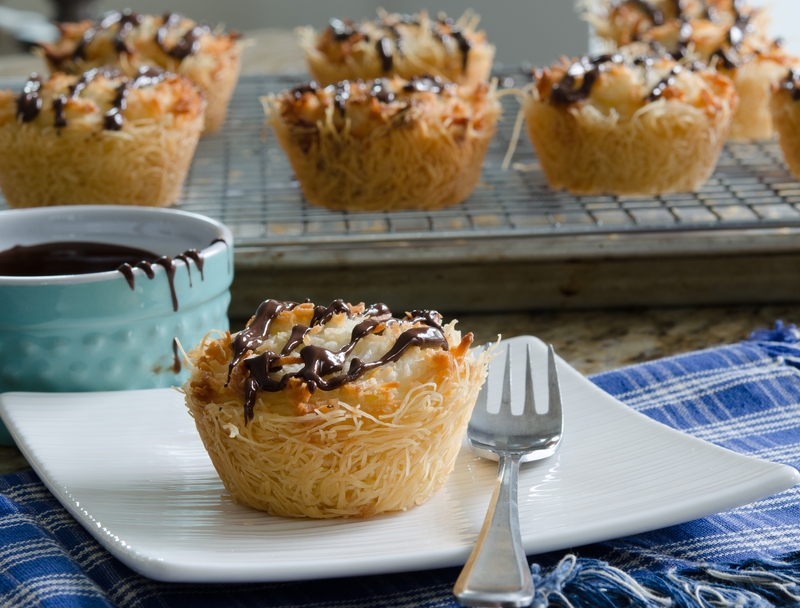 I hope you enjoy this recipe and I vow that there are more Kataifi recipes on the horizon. I am bringing a big plate of my latest creation over to Angie’s Fiesta Friday. Please join our virtual blog party at FiestaFriday.net . You will be thrilled with the talent and enthusiasm of all of the other bloggers that throng there every Friday. This pastry is just so much fun to work with! Here’s what to look for when you go shopping. Place the shreds in a bowl with the melted butter and use your hands to incorporate the pastry and butter. The strands just need to be nicely coated with the butter. Place a small handful of the mixture into medium-sized muffin tins and press against the bottom and sides to form the tart shells. Set aside. In a medium bowl, lightly whip the egg whites with a whisk. Add the sugar, vanilla, and lemon rind and mix well. Add the coconut and stir until all ingredients are well blended. Fill each tart shell with the macaroon mixture. Bake for 15 – 20 minutes until pastry and filling are golden and the filling is set, but not dried out. Once the tarts are cool enough to handle, place them on a cooling rack to cool completely. Melt the chocolate in the top of a double boiler. 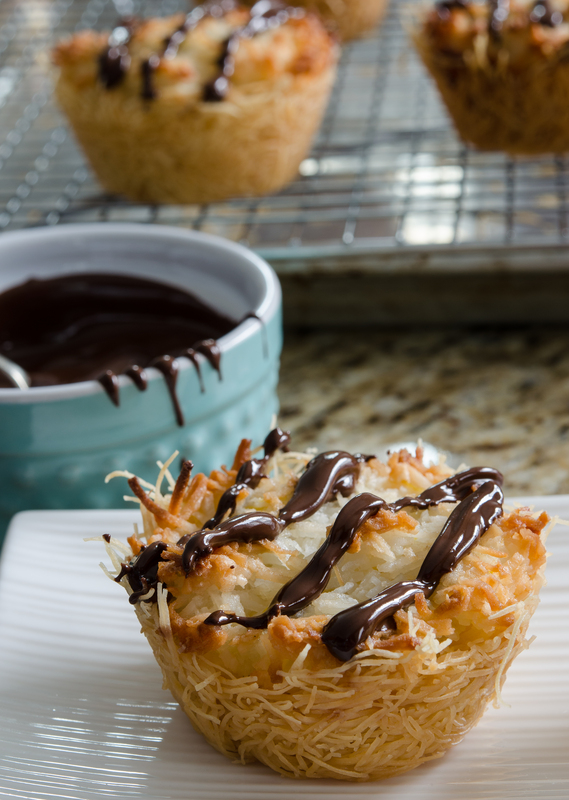 Drizzle the cooled tarts with the chocolate. Crunchy, chewy, sweet and addictive! 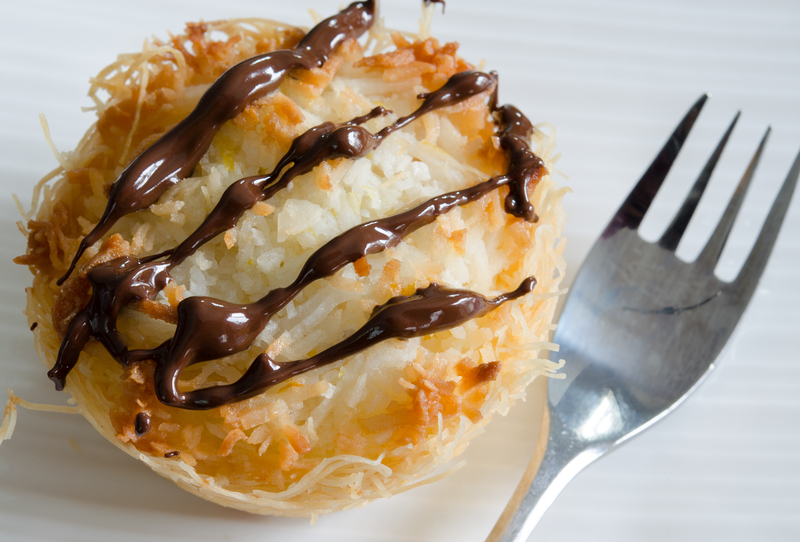 I think your macaroon filled kataifi is amazing. How delicious and beautiful they are. This is so creative, love it. Delicious! These flavors remind me a bit of the samoa girl scout cookies? You don’t need to because your cookies are better anyway! I love the idea of using this pastry. Glad you brought it along to FF. Hope you have a lovely weekend. Wow these are so amazing! I love the look of these Julianna! Oh, thanks so much, Lori! Thanks Lili! I think so! Hey Judi! If there are any Middle Eastern stores in your neighbourhood, you will find it there! Or Greek stores? Thant way you can save on the shipping! Not familiar with this pastey but will seek it out. The filling is made for me. Love these and so gorgeous too Juliana! I still remember the first recipe you made…. now you share another one and I feel “almost” guilty to have postponed the purchase of the kataifi dough! I have to make up for my laziness! I really want to get my hands on Kataifi!! I can’t find it anywhere (where I live) I will have to check in some other speciality stores to track them down! These tarts look amazing and I LOVE the lemon Macaroon filling! Good luck with this, Dini! I really hope you can find it somewhere! These looks amazing! Very creative:) thanks for sharing! Wow, that looks and sounds totally delicious! I always enjoy your pictures, you have real talent! Thanks for sharing. I noticed the word “ecstasy” used! I’m paying attention and plan to try these! Lovely! Will have to look very hard for kataifi, as I have not seen it anywhere. I love working with phyllo dough, but I can see where kataifi is a must. An inspired recipe!